While not often thought of as Topps cards, Bazooka issued an almost uninterrupted run of baseball sets from 1959-71, the vast majority of which were issued on the backs of boxes of their namesake bubble gum in panels of three. 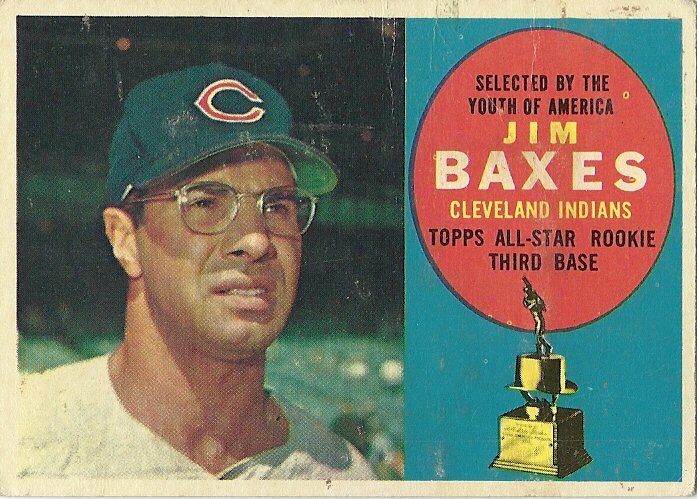 The Bazooka cards often featured better photography than their Topps brethren. Some years tend to look alike though but dem's da breaks! Silver cards are harder to find but don't seem to tend toward the pink toning seen on the borders of the golds. 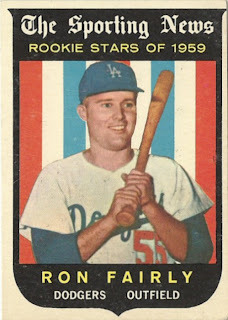 Locked in a battle with Fleer over the rights to various current ball players in 1963, Topps hit the boys from Philly right in the labonza with the insert set as Fleer had issued cards of old timers over the previous three years. 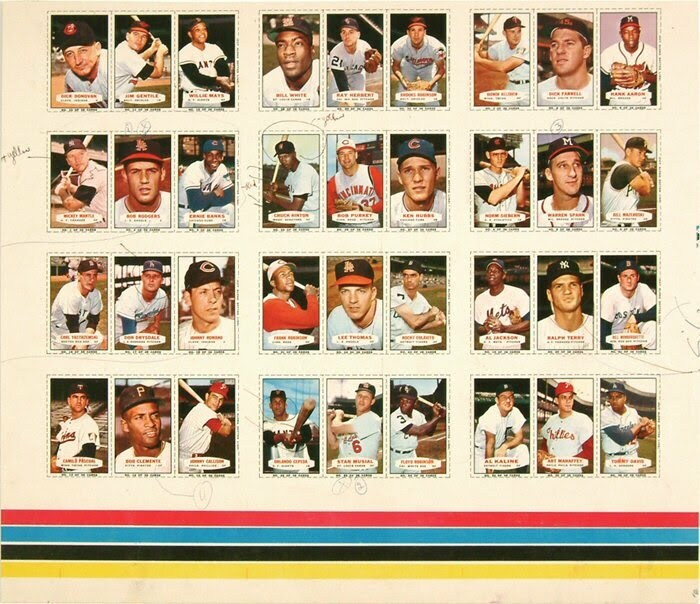 There are 41 All Time Greats in the insert set. There are 36 current players in the '63 Bazooka set, a total that was fairly consistent over the years the cards were printed. 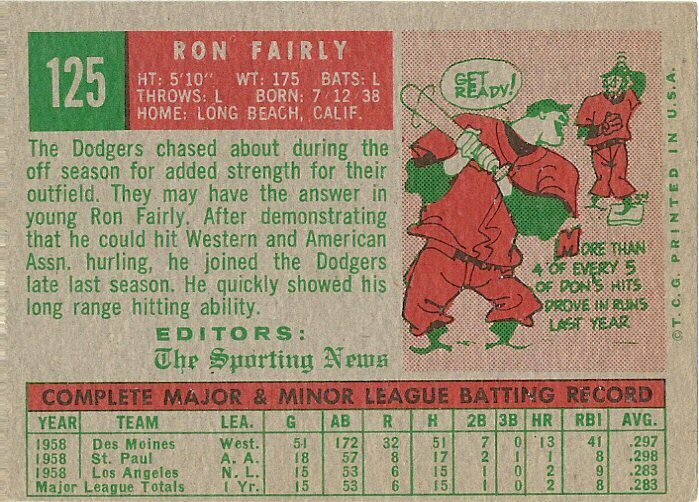 Panels are very collectible today and display nicely but there is far less interest in these cards than in the mainstream sets issued by Topps. That scan is lifted from some major auction or another I suppose but the off-kilter look belies that. It measures about 6" x 8" and there is a little eyelet at top to hang it. Construction is of plastic according to the guides. It is definitely not a mask though and clearly is a plaque. 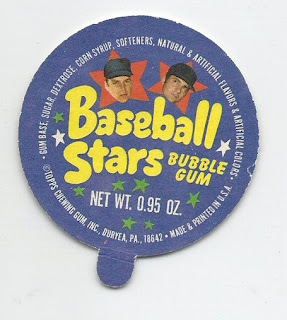 The story is that this was a premium available on high number '63 wax pack baseball wrappers but a discussion over at Net54 a while back revealed none of the wrapper experts there had ever seen such a thing. 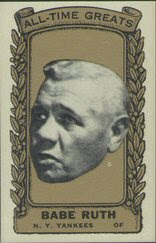 I think it possible the Mantle was a Bazooka premium, either from the comics or part of the retailer premium certificate redemption program but without actually being able to see one (they are quite rare) the Topps provenance is speculative at least in my eyes. 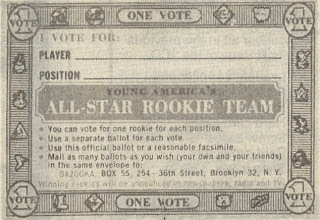 I mean all the hobby lore says it's a Topps piece and has for as long as I have been involved (1981 you young whippersnappers!) but I would like to see the offer somewhere. Well non-sports fans, we are back in action on the Winners front! As previously speculated upon, there was indeed an entry blank provided by your friendly neighborhood shopkeeper. 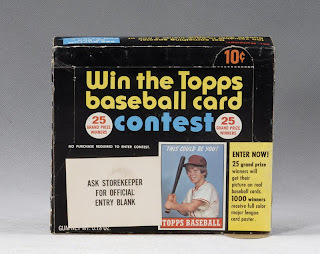 Now, given that we have two sisters who won this contest, I have to wonder if perhaps only a couple of entries from each test retail market made it in to Topps HQ in Duryea . I have to further wonder if this whole scheme was merely an early effort to track buying demographics on the part of Topps. 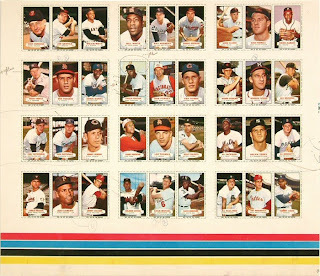 Oh yes, we also have a lead on a consolation prize poster premium featuring the 1971 baseball cards, with a maximum print run of 1000. I have never even seen one! And despite the promise of 25 grand prize winners, we are still stuck at fifteen known subjects thirty eight years later. 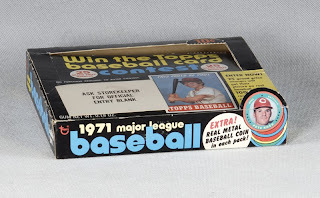 There is some nice graphics work on the box and the pop up tab of a Pete Rose coin is classic. 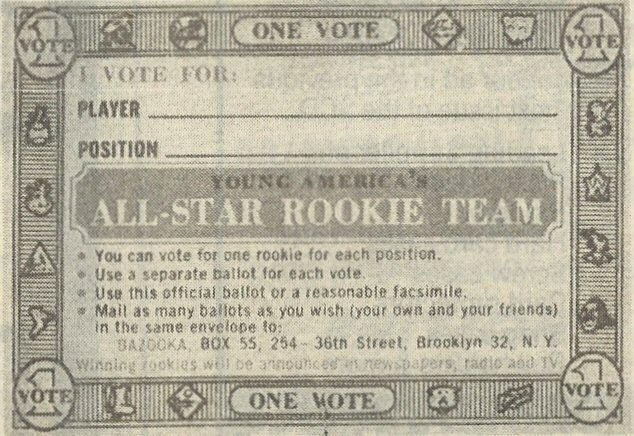 As previously detailed here the Winners cards were actually distributed in limited quantity inside 1972 baseball packs that were given to the contest winners along with two vending boxes worth of their individual cards. 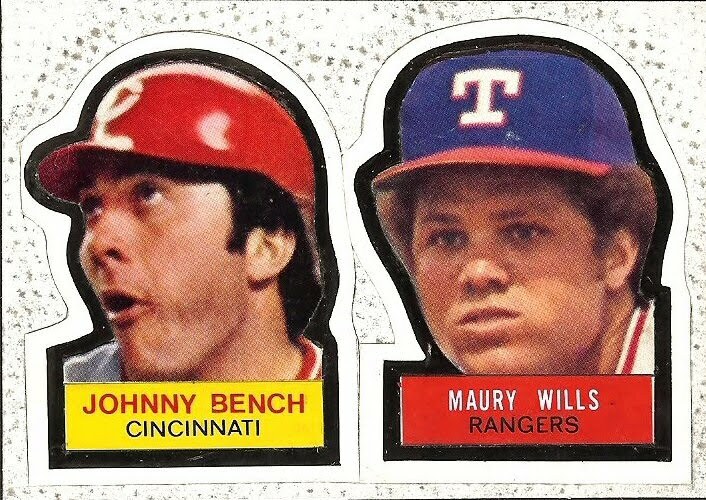 This means they were the last Topps baseball inserts until the UV era. 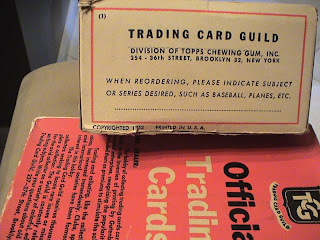 If you have followed this blog over the past fifteen months or so, then you will certainly recall references here and there to the Trading Card Guild, a crafty transposition within the “TCG” acronym of Topps Chewing Gum. 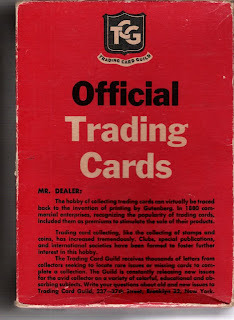 The Trading Card Guild looks like it was started as an effort by Topps to sell cards in higher-end establishments, at least when compared to the corner candy store or the local 5 & 10. Primordial efforts in the Fifties yielded a ten cent price point for packs and featured fancier cellophane wrappers. I have to think these marketing efforts, which stressed the educational aspect of the hobby, were aimed at parents and possibly teachers. 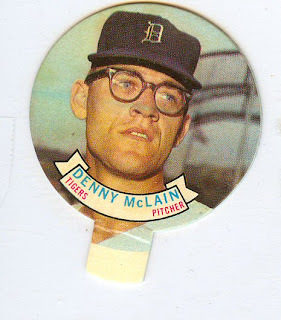 After all, what kid would give a hoot about learning something valuable from his or her cards, especially when there was no gum to be had in the packs? 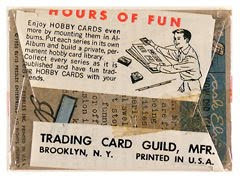 There was likely some overlap between what types of establishments were offered Guild packaging by their jobbers or wholesalers vs. the "regular"penny or (more likely) nickel packs and I would think only select cities and suburbs were targeted. 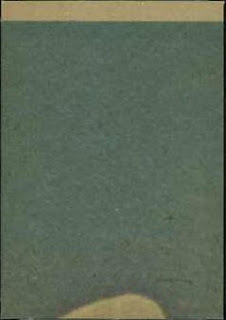 The earliest thrust of the Guild seems to be centered upon “twin-windowed”, horizontally elongated backs that held sets issued in panels. 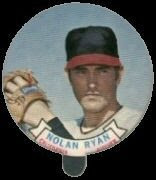 It is possible the move was in response to a Bowman campaign that sold cards in ten cent packs and used a newsletter to entice parents to buy more educational product. 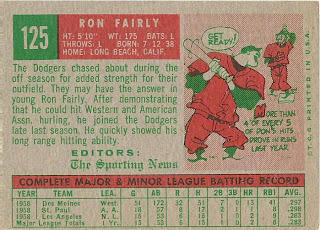 The earliest sets I have seen reference to that were sold this way are the 1951 Red & Blue Backs but I would not be shocked if they are a year older. 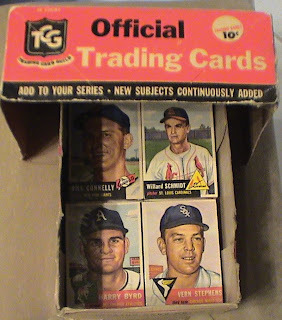 I wonder, without cause I might add, if these packs are the source of the hobby lore wherein leftover high number 1952 baseball cards were mixed in with first series 53’s? 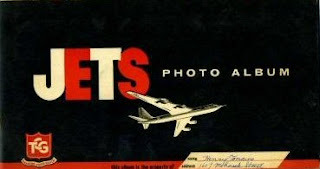 I wonder if any set was available on an a la carte basis? 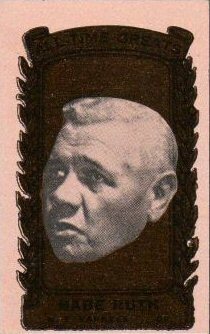 A couple of years later, Topps 1955 All-American football cards were sold in packs similar to those containing the '53 baseball cards but with almost twenty cards within. Some of these were found years later in an old candy store so not all large cello packs went to Grant’s or A&S! 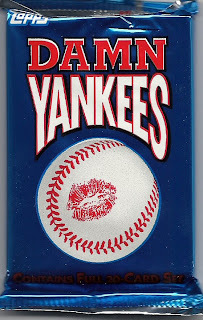 However, if you look at this CU thread, the All American packs were in a regular Topps box. Damned strange if you ask me. 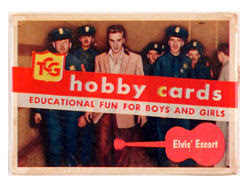 There is at least one album associated with the Trading Card Guild, from the 1956 Jets issue and I ponder if that was a common denominator since, as you can see from this box that held the 1953 baseball packs and the Elvis reverse above, that you could write to the Guild and obtain all sorts of things and albums would certainly help move some packs of cards. Various issues appeared within these red and black wrappers and the moniker also was used for 500 count vending boxes, as this 1964 Beatles artifact clearly reveals. 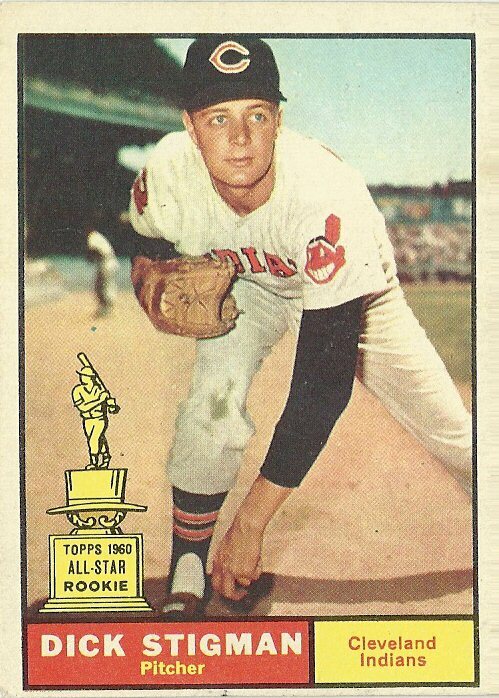 I suspect the Trading Card Guild efforts died out when Topps moved their production facilities to Duryea in 1965 but am not 100% certain. 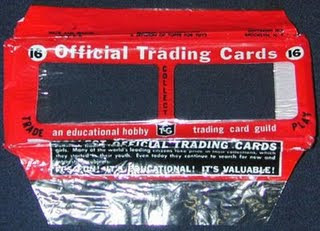 It would be great to work up a full list of Trading Card Guild packaging and sets as there is scant information on the web or in print concerning this subject. I’ll post updates here as things develop. 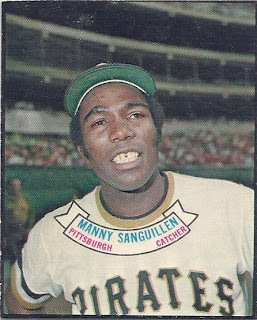 Stumbled across another Topps Mexican issue from 1977 on Ebay and decided to steal a couple of scans. 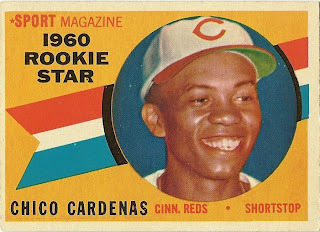 Devoted readers will recall the Archive took a vacation in Mexico this past January and looked at three sets issued south of the border circa 1977. 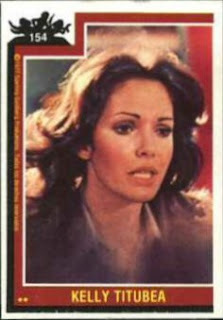 I believe that caption translates to Kelly hesitates. Given that this is card #154, the Mexican version must have had some life to it as in the US release this was well within the 3rd series (of 4). ...but wouldn't you rather look at the fronts? 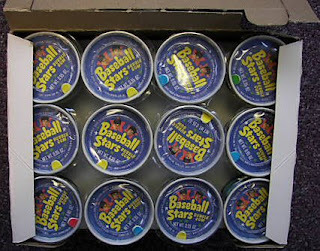 Right in the middle of various Topps efforts to see if non-team licensed cards and other like items would sell, they managed to release a pretty nice set of 55 baseball players whose mugs served as the underside of lids for a product called Baseball Stars Gum. While the name harkened back somewhat to 1951 and its truncated sets and rancid caramel, the look this time was decidedly modern. It just took four years worth of development to get there. 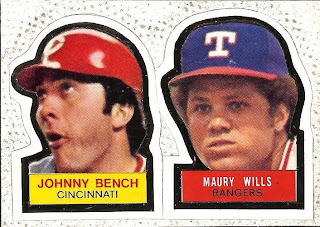 Two hall-of-famers and a popular slugger (ol' Hondo could really rake) is a pretty good array and is what would have greeted purchasers had they stumbled across a box (likely generic white) of these. The green stars are nice too and you will note there are team logos all over the place. 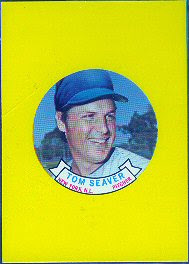 The set numbers 24, one for each team at the time. 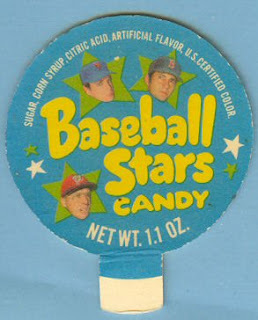 Too bad Baseball Stars Candy went thud, although it may have been due to the candy as a non-sports set from that year called Rocks O' Gum has lids with pithy cartoons that can be found with much more regularity. There is also a variant called Gum Berries that seems a little tougher than the Rocks, so the gum may have done the trick. Note the name change and the removal of Frank Howard. Little stars have also been added and the design is a bit more modern than it was two years prior plus a darker blue was used. Like the front, the players have had the team logos removed from their caps. There were 55 different players (possibly 56, there is a discrepancy) proofed. 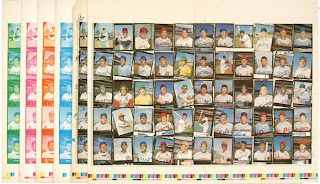 As the 1973 set also had 55 players, the transitional nature of the 72's seems correct to me. 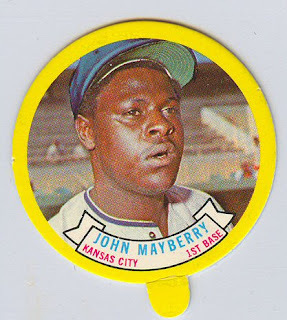 I believe the 1970 lids to be harder to find than the '72 proofs, although the price guides do not necessarily bear this out. Blue, red and green are showing but orange is also a possibility. I imagine the stars around the players heads turned red as an attention grabbing device. All caps are logo-less, just like the proofs. Friend o' the Archive Bob Fisk sent along a scan of a proof process sheet awhile back, I can finally use it, huzzah! The 73's are not common but neither are they scarce. You can find them with a little digging. 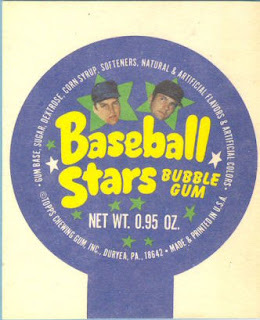 Don't eat the gum if you find a tub though as I'm sure they have the texture of moon rocks these days. Ouch! 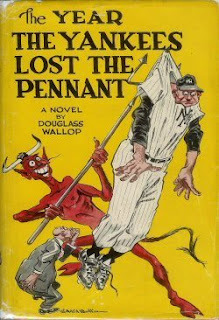 Damn Yankees started life as a 1954 novel by the appropriately-named Douglass Wallop titled The Year The Yankees Lost The Pennant and centered around a phenom named Joe Hardy, who has made a Faustian bargain with one Mr. Applegate to help his beloved Senators win the AL pennant. You have probably heard "Whatever Lola Wants", the most famous song from the show, a few times. 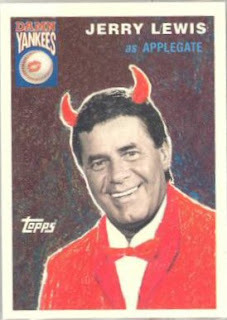 The set and Lewis card pop up on Ebay with some regularity and can be had for, dare I say it, a song. I don't want to open mine, so I'll track down a few scans and post 'em in a catch up thread, which is long overdue.